I think of you every time I chop onions. This is the way it has always been. The association between you and onions reckons back to the countless weekend evenings spent preparing meals in our kitchen in Vientiane. The task of chopping onions was yours by default because the pungency of the onion juice never bothered you like it did the rest of us. You did this task cheerfully just as you approach every other task that I have seen you undertake. 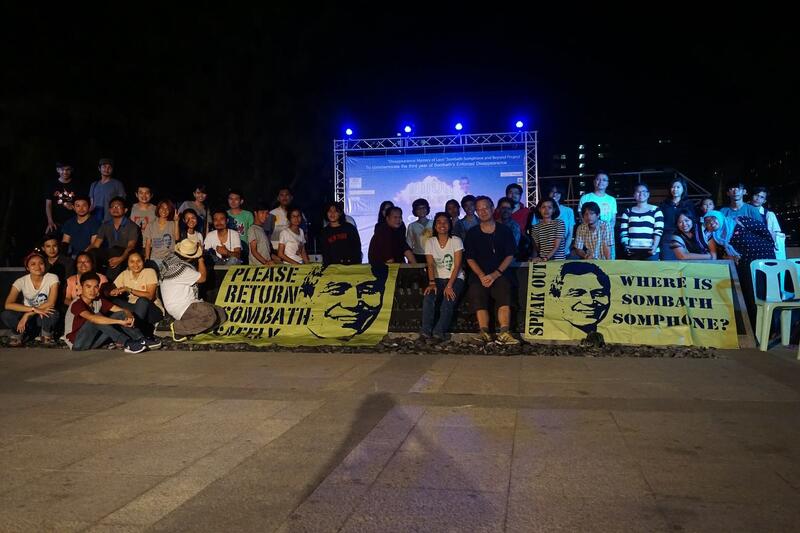 So it is that when I chop onions, as my eyes burn and tears stream down my face, I cannot help but whisper under my breath, “Sombath, where are you?” Of course, that question is so much more poignant now when there is such deep and disturbing uncertainty about your whereabouts. I remember those meals we prepared together not for the delectable food but for the raucous laughter, the bantering of ideas, the planning and comparing notes and encouraging each other in the exasperating but incongruously rewarding work we were engaged in. And these meals were often followed by a delightful and relaxing trip to the sauna at Wat Sok Pa Luang. What pleasure! We often had the place to ourselves. This was one place that we could go and actually experience the oppressive humidity of a typical Vientiane evening as cool and refreshing. I remember also your frequent spontaneous arrivals at our home around the dinner hour which delighted us and required two extra places to be set at our table. Known as “Bat-bat” and “PIngping” to our young children, you and Shuimeng were constant features in our lives during those years. You were family, indispensable and always present at each and every birthday, holiday celebration or festival. Our children were shaped by the experiences they shared with you. Thank you for helping us raise these beautiful and bright children! We met you soon after our arrival in Laos and knew immediately that we would rely on you, having recognized that you would be a very congenial friend and capable teacher. We had so much to learn and you had so much to show us and did so in such a gentle engaging way. This is your manner with all the lucky ones that call you teacher. When Shuimeng moved to Laos shortly after we did, we shared the experience of learning the Lao language and culture. We learned about Laos together. We learned to love Laos together. That is how Shuimeng became our sister and you our brother. To say that development work in Laos was challenging in the early to mid 80’s would be an extreme understatement. I remember it as an exciting time, however, in which we watched our role in development shift from bricks and mortar to village based integrated community development projects, ideas that were often incubated around our dinner table or yours. After all, it made sense for us, trained as lawyer and nurse, to test our development ideas with an expert! Your mentorship and collaboration around sustainable agricultural techniques and gravity flow water systems allowed us to expand the local impact of our work in ways that otherwise would not have been possible. The stories of adventures shared during travel to some of the most remote corners of the country are deserving of a book. Truly, I cannot imagine working in Laos without your gentle guidance and companionship. Sombath, the last time we saw you was in Missouri at the home of Roger and Jacqui where we had gathered to support Roger who was struggling with cancer. This was a bittersweet reunion after a long separation. You were so hopeful for Roger’s health. You led us in meditation and I think, we were all granted healing at some level of our being. Of course, we spent a lot of time catching up and reminiscing. You interviewed us all on videotape about our thoughts on development and by so doing drew us all back in to the close circle where we know we belong. We had some idea at that time that we might lose Roger, but we did not consider the possibility then of losing you. I am so thankful for those few days of renewal and reconnection. Our time together was an acknowledged gift even as it unfolded but now, given the uncertainty of the times, the value of that gift is even more precious. I look forward to your next meeting with great anticipation. Until then, dear friend, wherever you are, I wish you the strength and courage to persevere. Know that you are loved and missed.